Betts & Scholl is a partnership between Master Sommelier Richard Betts and Dennis Scholl. Together, they have forged relationships with star growers and winemakers around the world to produce wines that they like to drink. With a preference for elegant, complex, balanced wines with great perfume and finesse, and more especially characteristic to their terroir of origin. Their first releases from Australia’s Barossa Valley have focused on Grenache, with subsequent wines made from Riesling and have just released new projects from California and the Northern Rhone focused on Syrah. This beautiful expression of Hermitage comes from one of the most special spots on earth, and has been realized this through working with one of the region's most notable and celebrated wine producing families. The contemporary artwork on our label was created by Mark Grotjahn, an internationally renowned artist who lives and works in Los Angeles, California. 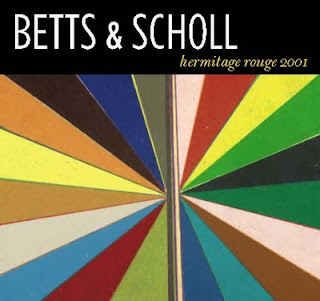 The 2004 Betts & Scholl Hermitage rouge is a blend of 95% Syrah blended with a touch Roussanne and Marsanne. The robe is bright ruby red, of medium intensity, with garnet reflects. The nose is quite intense and attractive with freshly crushed wild red and dark berry, stone minerality, floral notes and spice. The palate is rich and dense yet of medium intensity, somewhat elegant and earthy, offering plenty of red fruit flavors intermingled with earthy, floral and spicy notes. The lingering finish is evidently calling for another glass of this well crafted Syrah based wine. overall, the acidity and the mineral keep it in focus and the tannins framing the mid-palate and the finish remind us how age worthy some of this Northern Rhône wine can be. to drink now after decanting or to keep for another few years. Step into the Green! Drink more Biodynamic and Organic wines (and food) from sustainable cultures and respect the environment!